Certain foods in Ohio can be made in the home and sold at the retail level. These are called cottage foods. Information provided gives an overview of the rules and regulations for a cottage food operation. A “Cottage Food Production Operation” means that a person who, in the person’s home, produces non-TCS (temperature controlled safety) foods, including bakery products, jams, jellies, candy, fruit butter, and similar products specified in the rule. Environmental Health sanitarians inspect various food service operations to ensure that food is being handled, stored and cooked properly. At home, you can use many of the same safety tips to ensure the food you prepare is safe for your family and customers to eat. To a licensed restaurant to be used in the preparation of food. Cottage foods must be produced in a residential kitchen. The owner of the cottage food operation may only prepare foods in their own kitchen. The home may only contain one stove or oven that is used for cooking (a double oven is acceptable). Commercial grade cooking equipment is not allowed. The home must be located in the state of Ohio. 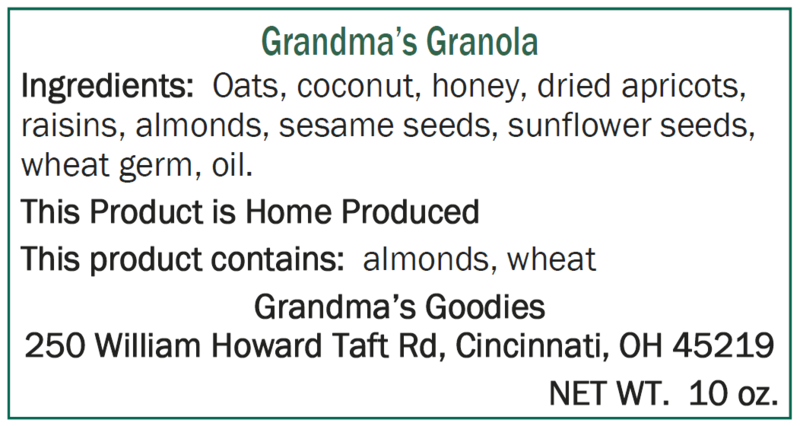 Allergen labeling that must be followed as specified in federal labeling requirements. If your retail food for sale display exceeds 200 cubic feet (100 cubic feet at a farmers’ market), a retail food establishment (RFE) license will be needed from your local health department. If you wish to also bake TCS baked goods (such as cheesecakes, custard pies, cream pies, meringue pies, pumpkin pies, etc), a Home Bakery license will need to be obtained from the Ohio Department of Agriculture. If there is any preparation or handling of non-prepackaged foods, a temporary food service operation license will be needed from your local health department. Cottage foods must be packaged prior to selling. Cottage foods cannot be packaged using vacuum sealing. Hamilton County Public Health offers a bi-monthly food safety training class. Classes occur on the first Tuesday of the month at 9 a.m. and the third Thursday of the month at 1:30 p.m. The cost of the course is $20 per person. Call (513) 946-7800 for more information or to register for classes. Questions about cottage foods or licensure? Contact Hamilton County Public Health at (513) 946-7800.